Demofoonte. 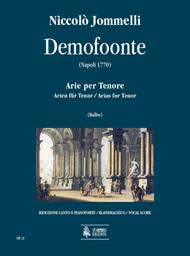 Arias for Tenor composed by Niccolo Jommelli. Edited by Tarcisio Balbo. For Tenor voice. Early Music. Vocal score. 40 pages. Published by Ut Orpheus (UT.OP-12).ISBN 979-0-2153-1813-7. Early Music.